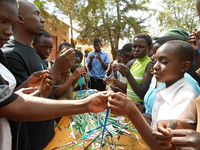 We held a two-day bead-making and painting workshop for about 75 young people at Kiyita Family Alliance (KIFAD) in Nansana August 23-24. James Nsamba, Farouk Mukwaya and Peter Kalyongo were the teachers. The colorful beads are made from narrow strips cut from pages of discarded magazines. The strips are rolled up, then glued and varnished. Glue can be made from banana skins. The kids also created a large acrylic-on-canvas painting. In the photo, Farouk Mukwaya is demonstrating the basic techniques.